An outbreak of Ebola has now claimed the lives of 27 people in the Democratic Republic of the Congo, according to the latest figures released by the World Health Organization (WHO). As of May 21, there were 58 total likely cases of Ebola: 28 confirmed (which includes the 27 deaths), 21 probable and nine suspected. In an effort to control the outbreak, high-risk populations are receiving an experimental "ring vaccination." As the WHO reported, more than 7,500 doses of the rVSV-ZEBOV Ebola vaccine have been deployed to the northwestern Equator Province of the Congo. As an ABC News report notes, ring vaccination is an approach used to control smallpox in the 1970s. The first batch of vaccines will go to healthcare workers caring for infected patients, followed by people who know someone with an infection. The vaccine will then go to individuals who know those people, continuing outward in this "ring" fashion. The vaccine was demonstrated to be highly protective against Ebola in a major trial in 2015 in Guinea. More than 5,800 people who came into contact with patients who had confirmed cases of Ebola received the vaccine. No Ebola cases were recorded nine days or more after vaccination. The rVSV-ZEBOV vaccine is awaiting review by regulatory authorities. 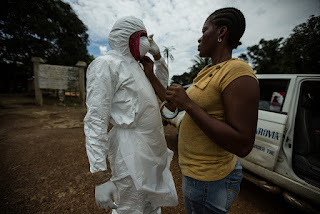 In 2014, an Ebola outbreak in West Africa ended with more than 28,600 cases and 11,325 deaths, according to the Centers for Disease Control and Prevention (CDC).